Sen. Nelson is grilling Zuckerberg about why ads for chocolate that he likes keep popping up on Facebook. Facebook shares extend gains as Zuckerberg testifies, last up 3.3 percent at $163.21. John Thune, chairman of the U.S. Senate Commerce, Science and Transportation committee, struck an adversarial tone in his opening remarks. 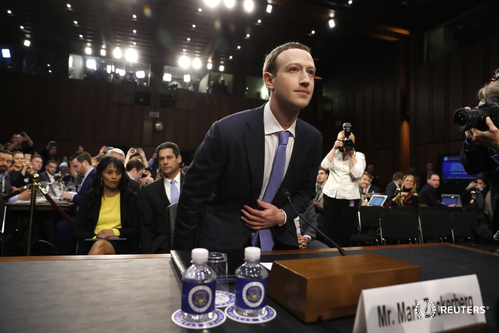 "In the past, many of my colleagues on both sides of the aisle have been willing to defer to tech companies’ efforts to regulate themselves. But this may be changing," he said. 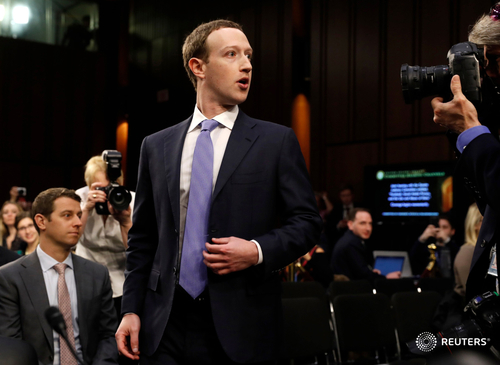 Facebook Inc Chief Executive Mark Zuckerberg will strike a conciliatory tone on Tuesday in testimony before Congress as he looks to fend off the possibility of new regulations as a result of the privacy scandal engulfing his social network. Facebook CEO Mark Zuckerberg’s No. 1 mission during his Senate hearing will be to defend against calls to regulate internet-based companies. He is confronting combined outrage over how Russia used Facebook to spread divisive political propaganda during the 2016 U.S. presidential election and how Facebook seemed unaware that a political consultancy, Cambridge Analytica, improperly harvested personal data of about 87 million Facebook users, most of them Americans. 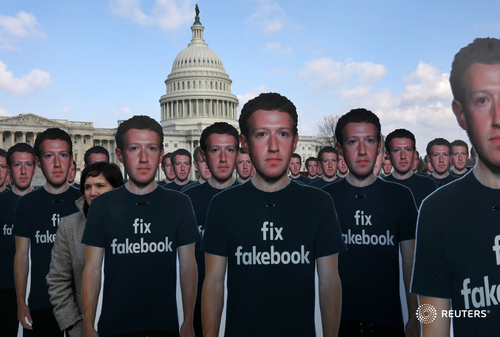 The prospect of new laws that restrict Facebook and other internet companies, however, is extremely unlikely not only because of a lack of political will and the effective lobbying of technology companies but because few lawmakers want to grapple with the sheer complexity of the technical issues involved. 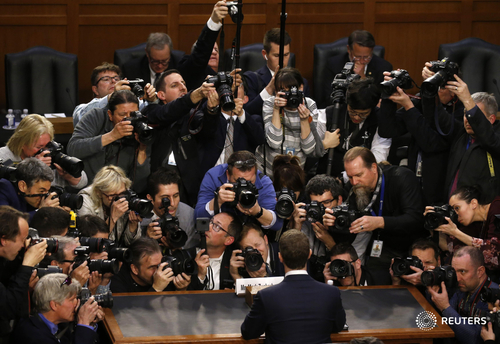 Reuters TVFacebook CEO Mark Zuckerberg begins his first-day of congressional testimony as lawmakers probe the social network's massive data scandal and Russian attempts to sway the 2016 election. 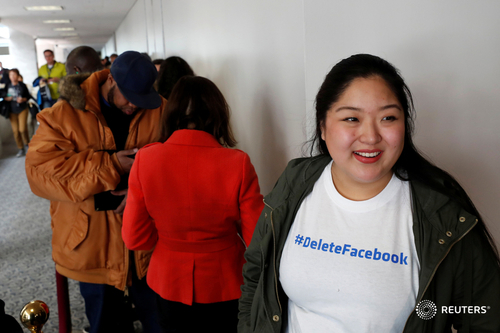 Top of the agenda in this week’s hearings will be Facebook’s dealings with Cambridge Analytica, a London-based company that counts President Trump’s 2016 campaign among its past clients, or go-betweens. 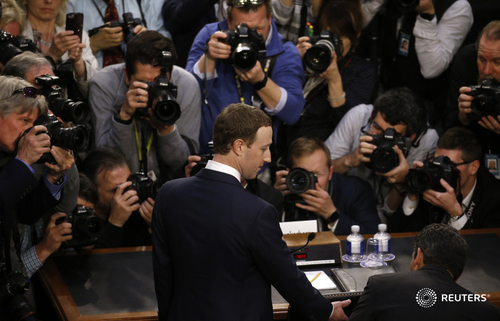 Cambridge Analytica has disputed Facebook’s estimate of the number of affected users. 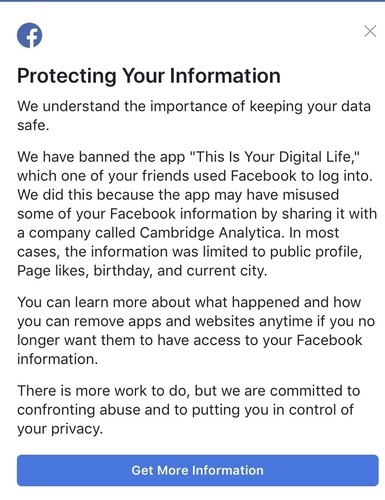 Some Facebook users are opening their accounts to find this message today. U.S.Facebook Inc has often angered users by its handling of personal information. Almost as often, Chief Executive Mark Zuckerberg has apologized. U.S.Facebook Chief Executive Mark Zuckerberg's No. 1 mission during his appearance before U.S. lawmakers on Tuesday and Wednesday will be to defend against calls to regulate internet-based companies.